High quality and high performance EAS anti - theft self adhesive labels. Labels come in 1000 label rolles. These Labels are compatible with Checkpoint and all other Radio-Frequency (RF) EAS systems and deactivators. These labels are perfect for products with high moisture content - meat, sausages, cheese, others. The most effective and secure label on the market. 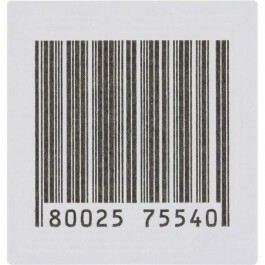 RF labels, white with a dummy barcode printed on the top face and a sticky back for application onto packaged goods. The label is detected at the door by the EAS system if it has not been deactivated. Available in size: 4cm x 4cm.